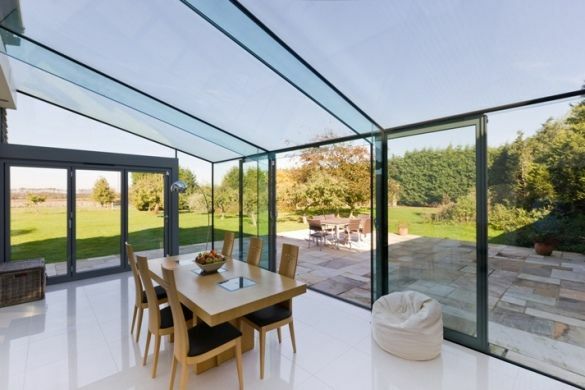 Determining the best glass type for conservatories. Considering heat insulation, toughness, flexibility of design such as Solarlux sliding or bi-folding doors. Far from being an afterthought, the right glass for a conservatory is an important decision. Factors such as heat insulation, strength, and flexibility in terms of design can make or break a successful conservatory. There have been significant developments in glass over the years – it’s certainly not just a case of glazing with the standard formula. Much heat is lost through windows and they’re usually the most vulnerable part of a property in terms of heat loss. With a conservatory being mostly made of glass, it’s clear this is a key consideration – especially if the intention is to use the space all year round. Insulation is measured in U values – the lower the number, the better the insulation properties of the material concerned. Typical glass U values range from 5.0 in the case of a single pane of glass to just 2.2 for certain types of triple glazing. Large areas of glass are vulnerable to cracks and full breakages, so specifying toughened glass may be a consideration. Even a small stray stone thrown from the blades of a lawn mower can cause some expensive glass damage, and with the increasingly windy conditions the UK experiences due to climate change flying debris can be a risk. If certain types of door design or a winter garden effect is required (where the conservatory is very close to the garden making it feel as if the space is part of it) then specialist glass is required. Designs from manufacturers, such as German company Solarlux with over 30 years’ experience in the glazing industry, offer flexible door options. These are becoming a popular choice for making more of a conservatory space. Affording a large glass area, these doors – popularised by Solarlux – allow plenty of light in and promote a feeling of spaciousness. Fitting them between the conservatory and the rest of the property provides light and airy access yet seals the space off in order to conserve heat when required – helped by the fact they’re heat insulating. Because the design makes for large areas of glass with little required by way of frames between individual panes, a ‘glass wall’ effect can be created with unobstructed views out to the garden. Thanks to the folding and sliding manner in which they open and shut, they allow for considerable flexibility. It’s possible to slightly open them to allow a little airflow or open them wide when temperatures rise to make the most of the sunshine. They’re designed to fit most spaces so many conservatories could benefit from the flexibility of a bi-folding door. Solarlux glass carries the CE mark to show it complies with European Community safety directives. The type of glass and its specialist use – such as in the case of Solarlux – is a key aspect of an effective and comfortable conservatory design. It’s important to ensure experts help install a conservatory, and in the case of Solarlux glass a conservatory company equipped in working with it. Mark Caulfield is the Founder of bespoke conservatory designers The Caulfield Conservatory Company.